The lymphatic system is an integral part of our bodies, with several important functions: it is part of the immune system, helping to clean out germs; it transports fats, and it returns fluid from all areas of our body to our circulatory system. When that last function is compromised, we experience swelling that does not go away. That condition is called lymphedema (LE), a chronic, progressive condition. It can occur as primary lymphedema (due to genetic or familial causes) or secondary lymphedema (due to damage to the lymph vessels). Some of the reasons for damage to our lymph vessels are obesity, chronic venous insufficiency, surgery, and radiation. LE is first experienced as a sense of heaviness of the limb and may not be visible as swelling. As it progresses, swelling becomes evident and can be debilitating. It is very important to manage the swelling! It is caused by protein-rich fluid accumulating in the area, a perfect growth medium for infections such as cellulitis. Each episode of infection causes further damage to the lymph vessels, creating a vicious cycle of increased swelling, increased risk of infection. LE is classified in stages from 0 to 3, with increasing tissue involvement as the condition progresses. It is wise to pursue treatment early in the process. The gold standard of LE treatment is Complete Decongestive Therapy (CDT), performed by a certified lymphedema therapist. The treatment consists of the therapist performing manual lymphatic drainage and applying compression bandages until the LE is reduced and contained, then measuring for appropriate compression garments for independent use by the client. CDT also includes comprehensive education on what LE is, instruction appropriate personal care and hygiene, and the establishment of an exercise program to assist in maintaining the reduction of LE. CDT is paid for by Medicare Part B when provided by a certified lymphedema therapist who is also a physical or occupational therapist. If you have lymphedema, please understand you can live a full and satisfying life! While there is no cure for it, with appropriate therapy, you can contain the swelling and maintain your mobility. A pain-free movement starts here! 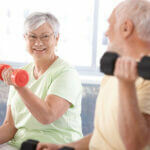 We provide in home physical therapy. For more information, contact us at Wilmington, New Castle County & Kent, DE center.